Antonio Banderas has launched Urban Seduction, a new trio of limited edition flanker fragrances. Last year's edition was the Cocktail Seduction trio. Urban Seduction Blue for Men (shown) ~ a flanker to 2007's Blue Seduction, with marine accord, amber, mint and musk. Urban Seduction in Black for Men ~ a flanker to 2009's Seduction in Black, with notes of blood orange, citrus, amber and woods. 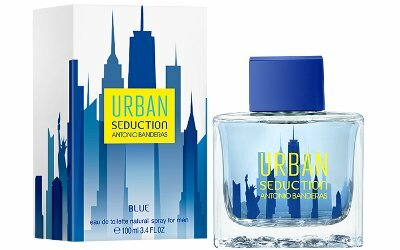 Urban Seduction Blue for Women ~ a flanker to 2008's Blue Seduction for Women; notes include orange, pear, yuzu, jasmine, gardenia, amber, black currant, cedar and patchouli. The Antonio Banderas Urban Seduction fragrances are available in 100 ml Eau de Toilette.